Prague (Boh. Praha, Ger. Prag), a city of the Austro-Hungarian monarchy, capital of Bohemia, on the Moldau, 155 m. N. W. of Vienna; lat. 50° 5' N, Ion. 14° 25' E.; pop. in 1870, 157,713, of whom about 90,000 were Czechs and the rest Germans and Jews (inclusive of suburbs, 189,949). It is situated in a picturesque valley, surrounded by hills. The Moldau, spanned by the massive Charles bridge of the 14th century, with a monument of St. John Nepomuk, and by other bridges, and embracing in its course several islands, flows through the city from S. to N". On the E. bank are the Altstadt, or old town, the principal business quarter; the Neustadt, or new town; and the Josephstadt, which is almost exclusively inhabited by Jews. On the left bank are the Hrad-schin, with many edifices of historic interest, among them the former palace of the Bohemian kings, and the Kleinseite, which contains the diet house, the principal government buildings, and many palaces belonging to the nobility, including the Waldstein or Wallen-stein palace. Outside of the city wall, which is 12 m. in circumference, and provided with eight gates, are the suburbs of Karolinenthal and Smichow, a manufacturing centre, and the ancient acropolis or Wysehrad. The city has fine squares and streets, many Catholic and several Protestant churches, and 10 synagogues, one of them, a small Gothic building, the oldest in Europe. Its numerous domes and turrets give Prague a semi-oriental appearance. 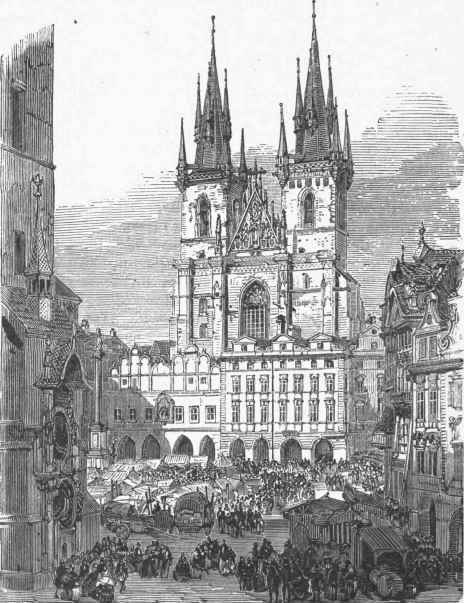 The cathedral, in the Hradschin, contains the shrine of St. John Nepomuk, ornamented with about 37 cwt. of silver, and a mausoleum erected by Kudolph II. ; its belfry is over 300 ft. high. The Theinkirche, in the Altstadt, said to have been founded in 880, contains the tomb of Tycho de Brahe. The university of Prague, established in 1348 by Charles IV., after the model of that of Paris, was attended early in the 15th century, when Huss lectured there, by 20,000 students. In 1873 it had 154 professors and 1,811 students, of whom 1,178 were Czechs. It comprises departments of theology, philosophy, law, and medicine, an observatory, a botanic garden, and various other institutions and collections. There are two polytechnic institutions, one German with 39 professors and 451 students, and one Czech with 45 professors and 713 students. In 1874 the library of the university had upward of 140,000 volumes. The collection of books in the Strahow monastery numbers 50,000 volumes, and those in the Lobkowitz and Kinsky palaces respectively 70,000 and 40,000. The principal manufactures are cotton and linen goods, machinery, leather, and glass. - The origin of Prague is obscure, but a portion of it was probably built in the 8th century. It has suffered greatly from the ravages of war, particularly during the Hussite contests. It witnessed the first outbreak of the thirty years' war in 1618, and in 1620 the battle which ruined the fortunes of the elector palatine Frederick was fought (Nov. 8) near its gates at the foot of the White mountain. In 1631 the city was taken by the elector of Saxony, and in 1632 retaken by the imperialists under Wallen-stein. The Swedes gained possession of the Kleinseite in 1648, but evacuated it in .the same year upon the conclusion of the peace of Westphalia. Prague was taken by the French and Bavarians in 1741. In 1744 it was reduced by Frederick the Great after a severe bombardment, but restored by the peace of Dresden in the next year. The same monarch defeated the Austrians before the city on May 6, 1757. In June, 1848, it was the seat of the Slavic congress, and the scene of a national Bohemian outbreak, when a desperate contest took place. Windischgratz, however, held the Hrad-schin, and thence bombarded the rest of the city, and within a few days the insurrection was entirely put down. The definitive treaty of peace between Prussia and Austria was concluded at Prague, Aug. 23, 1866.